We are a leading Exporter of indian printed suits, printed embroidery suits, salwar suits, printed designer suits, printed salwar kameez and printed salwar suits from Ahmedabad, India. Our company is very well known in the field of manufacture, export, trade and supply of Printed Embroidery Suit which could be availed in numerous specifications. Crafted with style, these suits are meant to be worn on any occasion and are fully customizable. In addition to this, these have variegated ranges and specifications. Created making use of advanced tools and technology, these have competitive prices. Quality is the hallmark of our company to meet tremendous quality standards we are offering a wide assortment of Printed Ladies Suit. 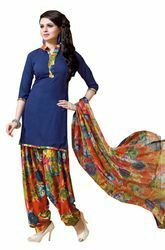 Looking for Printed Designer Suits Material ?